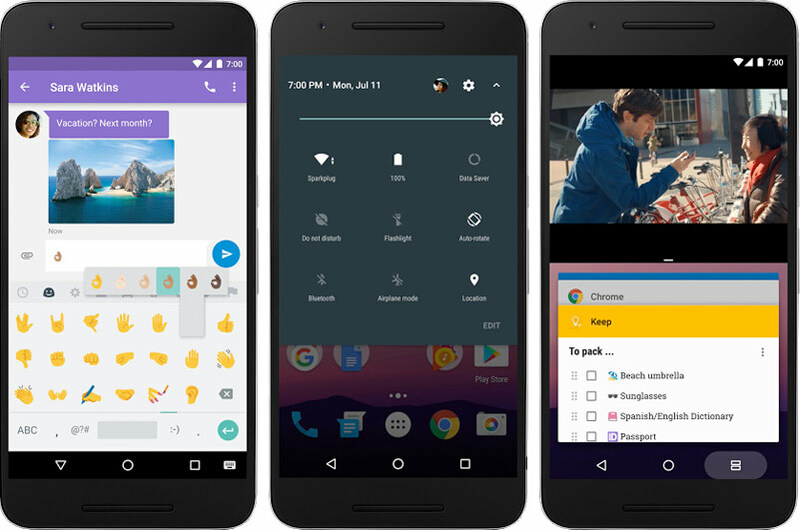 Android 7.0 Nougat: The Google’s latest version of Android Operating System Name has revealed on June 30, 2016. Now, the company announced the first supporting device and release date as Android 7 Nougat with Nexus. It is officially released out on August 22, 2016. As per the report of Official Google Android Blog, here we provided the Android Nougat features. The Android Nougat have totally 250 major features and from that, here we can see the few important features in the row below. The below-mentioned devices will get the System Updates via OTA. Moreover, the Android Nougat will available for the Android Beta Program enrolled devices. We all know about that the Android Nougat releases along with the LG V20. And it is the First Smartphone will arrive with Android 7.0. The New updated Android version have lots of changes under the category of Emoji. The Latest version of Android Nougat has more emoji. Here we showed some difference between the Emoji of Android 6 Marshmallow and Android 7 Nougat. The above-mentioned emojis was updated on Android 7.0 Nougat. We provided an image here below along with the Android 6 emoji and Android 7 emoji. 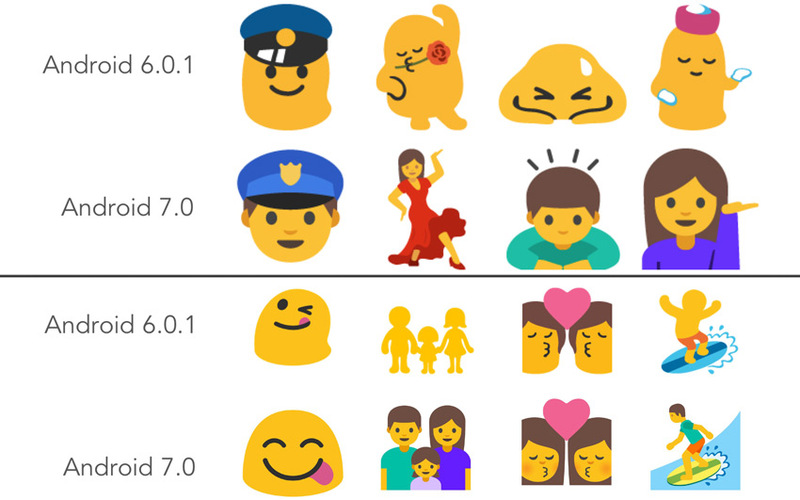 According to the report of emojipedia, the list of New Emoji which is supported on Android 7 nougat is listed below.
? Rolling On The Floor Laughing, ? Face With Cowboy Hat, ? Clown Face, ? Lying Face, ? Drooling Face, ? Nauseated Face, ? Sneezing Face, ? Prince, ? Mother Christmas, ? Man In Tuxedo, ? Shrug, ? Face Palm, ? Pregnant Woman, ? Man Dancing, ? Selfie, ? Hand With Index And Middle Fingers Crossed, ? Call Me Hand, ? Left-Facing Fist, ? Right-Facing Fist, ? Raised Back Of Hand, ? Handshake, ? Black Heart, ? Gorilla, ? Fox Face, ? Deer, ? Rhinoceros, ? Bat, ? Eagle, ? Duck, ? Owl, ? Lizard, ? Shark, ? Shrimp, ? Squid.
? Butterfly, ? Wilted Flower, ? Kiwifruit, ? Avocado, ? Potato, ? Carrot, ? Cucumber, ? Peanuts, ? Croissant, ? Baguette Bread, ? Pancakes, ? Bacon, ? Stuffed Flatbread, ? Egg, ? Shallow Pan Of Food, ? Green Salad, ? Glass of Milk, ? Clinking Glasses, ? Tumbler Glass, ? Spoon, ? Octagonal Sign, ? Scooter, ? Motor Scooter, ? Canoe, ? First Place Medal, ? Second Place Medal, ? Third Place Medal, ? Boxing Glove, ? Martial Arts Uniform, ? Person Doing Cartwheel, ? Wrestlers, ? Water Polo, ? Handball, ? Fencer, ? Goal Net, ? Juggling, ? Drum With Drumsticks, ? Shopping Trolley. 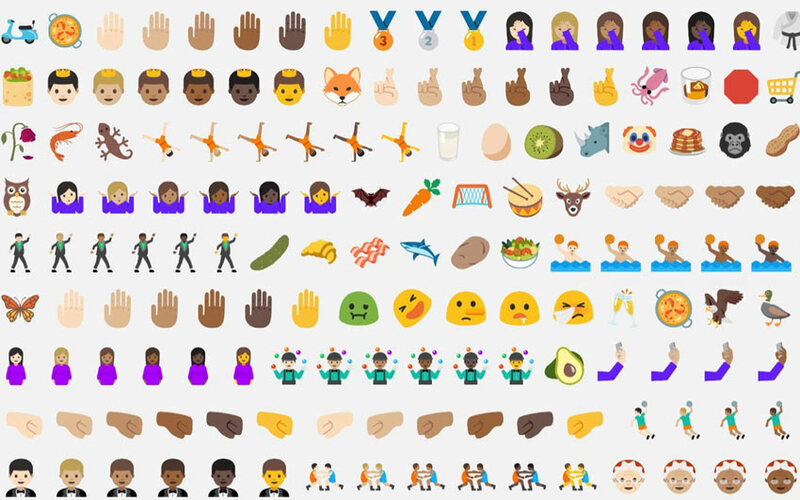 In the last version of Android included 209 new flag emoji and now, in this Android 7.0 nougat have an update. The Following flags are updated on Nougat. ?? Flag for Ascension Island, ?? Flag for Antarctica, ?? Flag for the Canary Islands, ?? Flag for St. Helena, ?? Flag for Tristan Da Cunha. Stay tuned for More Latest updates on Google Android!